So today I’m going to be starting a short series on how to make your own blog planner. This project is a little involved, and definitely not for younger children (there is pretty heavy use of sharp implements and a sewing machine), but for those who are willing to attempt it, they’ll be shocked at how easy it is to make your own books! 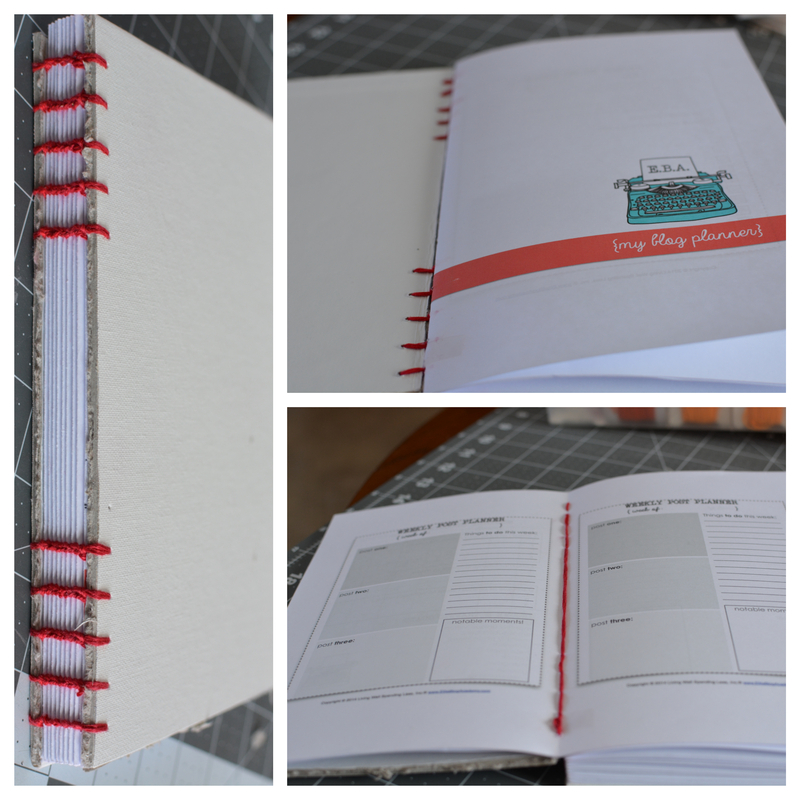 Day 1 of DIY Blog Planner: Book binding! For this project I used a free printable blog planner that can be found here: blog planner. I really love her stuff it’s super cute and clean and efficient, but there are TONS of free printables to be found on the internet, and there are even tutorials to teach you how to make your own lined paper (or alternatively you can just use fancy scrapbooking paper!). So this project can easily be adapted to just be a regular journal, or a day planner or whatever you want. Step one of this project is to print whatever you are going to use as the pages (if they need to be printed). Once you finish printing pages 1-16 you can then print pages 17-32, 33-48, 49-64, 65-80, 81-96, 97-112, 113-128, 129-136. 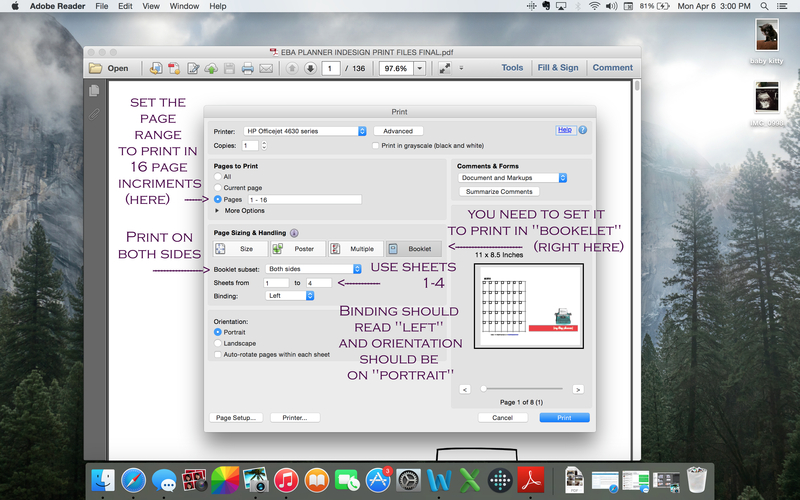 As each set of pages prints, it a good idea to fold it while the next set of pages is printing. The way you fold it is down the middle in the order they come out of the printer. That way when you hold that one little section of pages like a book the pages flow in the right order. Once that set of pages is folded set it aside, and fold the next set-being sure to stack the folded signatures in the right order. It’s SUPER DUPER SERIOUSLY I CANNOT STRESS THIS ENOUGH IMPORTANT that you DO NOT GET THE PAGES MIXED UP!! That is a nightmare, or at least it was for me, and so i literally had to start over. Fold as you go, don’t wait to fold everything at once. Also, it’s really ok that the last set of pages isn’t going to make a 4 sheet signature. That’s ok, to have the last signature be “short”. But if it really bothers you, you can print 132-135 just like you did the other signature pages and then insert it in the middle of the last signature set. Doing it that way won’t disrupt the page order, and all it does is give you extra “notes and ideas” pages. And who couldn’t use more of those? Step two is to actually begin binding the signatures together into a book. It really is MUCH EASIER to bind using a curved needle. You can get them in the craft section of walmart for literally $2 for a 4 pack. They might be labeled as upholstery or quilting needles, but whatever the brand you buy calls them they should be seriously curved. Like “C” shaped. Waxed thread isn’t really important. I’ve used both waxed and unwaxed thread, and I’ve never had problems either way. If you want to make your own waxed thread so you don’t have to order some off the internet, just take a small tea lite candle and run the thread of choice over the candle to wax it. Zoila! Waxed thread. The thread I’ve found to be easiest to use is embroidery floss. It’s nice and heavy, doesn’t tangle much, and comes in a million colors to match any project. Also it’s cheap. You can do this whole book on a single skein of embroidery floss with floss left over, and at my local Walmart a skein of embroidery floss is literally $0.33. Hope you guys like this new tutorial! I’m excited to show you my “cheater” method for crazy quilting using a sewing machine! ← Make your own journal or photo album! Lovely DIY post! Well done.